Beauty Tips 411 - Fashion Blog: cheap & chic! These are a great retro style pair of clear glasses with a plastic tortoiseshell frame. If you have been searching for clear glasses which is so on trend right now. These are perfect. Also come with a black or blue frame. This is designer inspired of the popular Prada sunglasses from a while back. Without the designer price many can now have access to these beautifully designed sunglasses just in time for summer. Price: $35.66 reduced from $67! The Alexis bag features a beautiful pebbled leatherette exterior with a belted top as well as a woven leatherette trims. It is built to last through many fashionable seasons. The addition of the glossy gold hardware and studs also makes this handbag pop. Comes with the dual handles as well as the detachable and adjustable longer messenger strap for versatility. Hobo chic at its best. The laser cut detail is so on trend and this bag also features a leatherette exterior and glossy gold trims. This burgundy red bag has a unique laser cut design on the front, revealing orange leatherette beneath, and embellished with round studs. Carry this tote by the dual handles, or attach the adjustable strap to wear on the shoulder. What a beauty! This is a sleek and sophisticated satchel with a glimmering color palette is just what you need for the dog days of summer! Our Edie Patent Barrel Satchel mixes the structured barrel satchel shape with a smooth patent leatherette exterior for a handbag that shines above the rest. Dual leatherette handles feature cream trim and silver tone hardware, as well as a hanging tassel lanyard. Attach the adjustable messenger strap to wear the Edie on the shoulder. This is perfect for the ladylike woman. This is a girlish black and white purse, with pin dots and prettily trimmed with scalloped edges, which matches the cute hem. 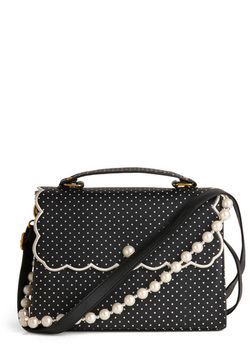 The handles are either the faux pearls handle, the top handle or the longer shoulder strap. while the longer set looks effortless on the shoulder. Perfect for spring/summer is this hobo bag that comes in various other colors besides the blue shown. This large sized hobo comes complete with plenty of fashionable flair to make this a must have for any woman who loves her bags. This hobo features a leatherette exterior with contrasting trims and gold toned hardware. Also features a tag and tassel adorned lanyard which hangs from the padded shoulder strap while the longer strap has exposed zipper trim which allows for greater versatility. Talk about va-va-voom! This lovely bag is perfect for the perfect for the fashionista in your life. The bow detail is everything and adorable and the grey toned logo charm detail is detachable. The exterior features pebbled leatherette that is built to last many season. The contrasting leatherette shoulder straps and trims add a certain level of interest that any woman wll love. Also comes in red. This is the perfect present for yourself for the New Year.